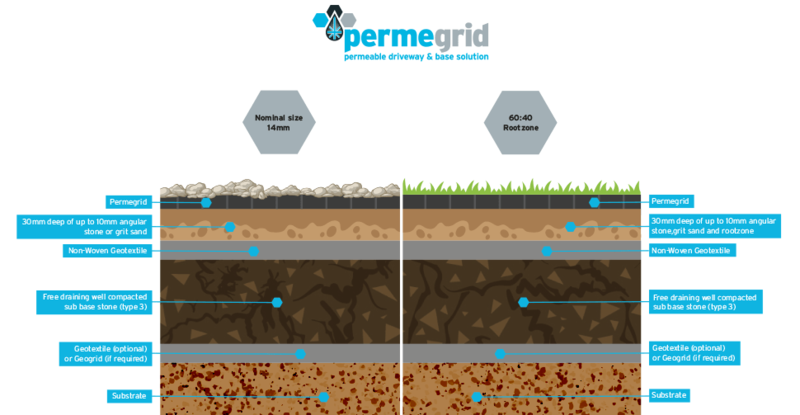 Both in the commercial and residential sectors, the benefits of Permegrid permeable paving are helping to reduce run-off surface water and aids in storm water management – as a sustainable drainage solution, it’s hard to beat. Permegrid is manufactured in Britain from 100% recycled plastic and is itself fully recyclable at the end of its life. It is lightweight to handle, yet incredibly durable and strong, it’s easy to install interlocking system means that it can be installed very quickly on a well-prepared sub-base. Permegrid is an eco-friendly, 100% British recycled and fully recyclable, SUDS compliant (sustainable urban drainage system) paving grid system for a range of applications. Here at STONES4HOMES we understand that our customers require the right products and information to enable a complete project package. Visit our product pages and you can get all the information you will need including product calculator, installation guides and relevant prices for your project or simply add your measurements into our online calculator and send us your project requirements. SUDs compliant, helping to reduce run-off surface water and aiding in storm water management.